My name is Chris Perna, and I'm the art director here at Epic Games. What are your typical job duties? What's a standard day like for you? It's my job to keep raising the visual quality of our products. I run a team of 40 or so internal lead artists, artists, animators, cinematics artists and level artists. On any given day, if I'm not in meetings, I can be seen at my desk putting out fires, directing concept artists, walking the halls to peek in on the other artists and animators or doing level previsualization. I usually jump in where needed. I love doing the monster stuff, concepting, skinning and texturing the creatures. That had to take a back seat in Gears of War 2 as I ramped up to the art director position and started to deal with the entire internal team as well as multiple external teams. Merchandising has become a big part of my day, and whether it's dealing with the great guys at NECA doing the Gears figures or offering feedback to the talented guys at WildStorm for the Gears comics, my days tend to take me all over the place. Marketing also became a huge part of my day to day. Being involved with Microsoft Game Studios and Digital Domain on a few commercials and collateral pieces was the icing on the cake. It does get crazy at times, and that's when I usually turn to traditional media to sooth the savage beast. I find that traditional sculpting, drawing or painting helps calm me and I can relax and take my mind off the demons of the day. Graphically, what were your goals going into "Gears of War 2"? I knew we had to raise the visual bar, but I had to figure out how we were going to do that. :) Gears of War was a nice looking game. Luckily, I have an incredible team of artists and animators who rose to the challenge. The team poured their hearts and souls into this project, and the end result surpasses the visual quality of the first. One of the things I decided early on was to tweak the post effects and bring back a little bit of color to the levels. We also balanced the contrast a bit and brought back some midtones. Those changes, along with some nice new lighting and performance optimizations from our fantastic engine team, enabled us to raise the bar and present a more beautiful, polished visual experience. What were the largest challenges that you encountered on the project? As I said before, the single greatest challenge was to raise the visual bar. We created some grand expectations with the first game and with this one we had to not only improve on the visuals but also create a bigger/better game and do it in half the time. :) It was a daunting task but we met it head on and I think the end product speaks for itself. I'm very proud of all the guys here and what we've accomplished together. The tools we had at our disposal made all the difference. We have an incredible toolset in Unreal Engine 3, and combining that with outstanding products such as ZBrush helped us improve our visual fidelity across the board and put out an incredibly high-end product in near record time. At what point did you decide to use ZBrush in your work on Gears 2? 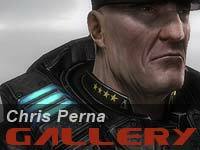 We integrated ZBrush into our pipeline about halfway through Gears 1, so using it for Gears 2 was a no-brainer. What we didn't expect was that ZBrush 3 would bring so much more to the table and allow us to push the envelope even further. How did ZBrush help you meet your goals and overcome the challenges presented by the project? We used ZBrush in everything from concepting to characters to environments. ZBrush allowed us to push our modeling details to the next level in every way. This made our characters and environments look amazing. We even used it for normal map generation of tiling textures. We were able to work faster and smarter to produce better results due to using ZBrush on this project. Do you think you could have done it without ZBrush? Not with the amount of detail we wanted, no way. Could you talk about how ZBrush was used to concept the Rockworm creature? Sure, normally our über concept artist James Hawkins would handle all the creatures, but we needed to get the modelers something ASAP, so I tackled the Rockworm. I started with ZSpheres, formed a basic shape, subdivided and started sculpting. It was so easy. Once I had some nice organic shapes going I pulled renders into Photoshop and composited the color and textures. What were the advantages in this method? One of the advantages is that I could rotate or pose the model and get a render from any angle. The high poly rough I used could have been used to create a base for the final model as well. It also allows you to play with the lighting and really creates a nice starting point for your concept, allowing for proper perspective and form. How do you like using ZSpheres to create starting models? They’re great. There was a bit of a learning curve figuring out what shapes would give me the cleanest mesh but overall it was really easy and fast to create desired shapes and start sculpting. Do you expect to use ZBrush for future concept work? Absolutely, it's great for quick iteration with organic shapes. At this point I'd like to turn the interview over to some of the team members that worked hands-on with the tools to create the fantastic art you see in the game. Would you say that ZBrush saved your company time and/or money while working on Gears 2? Portions of the materials used are ®, ™, (mr), and/or (mc) Epic Games, Inc., and/or copyrighted works of Epic Games, Inc., in the United States of America and elsewhere. All rights reserved, Epic Games, Inc.